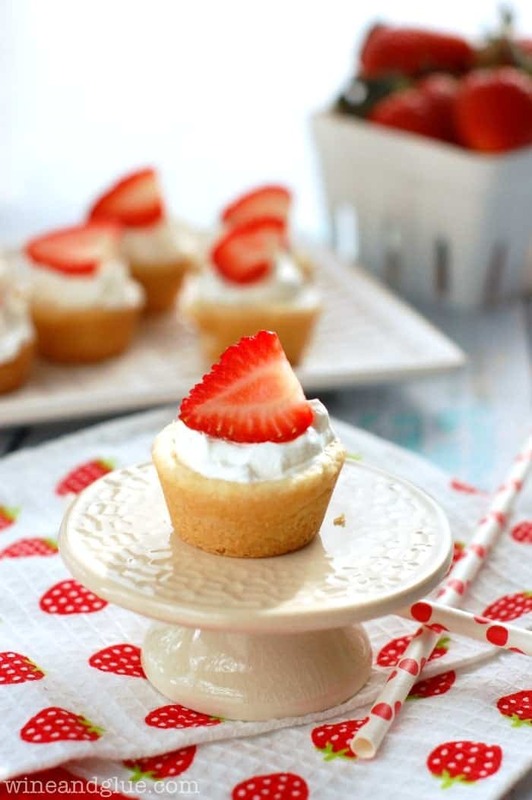 Strawberry Shortcake Sugar Cookie Cups | The amazing taste of strawberry shortcake in cute little cups! Can we talk about How I Met Your Mother for a minute? Or three hours? Because that might be how long it takes for me to wrap my head around what the writers did to us. So . . . I hated the ending. Hated. With a fiery passion. Like, I feel like I might need to write a letter or something. It would start with: Dear Writers of How I Met Your Mother, That was the meanest April Fool’s Day joke, EVER. Let’s talk about all the ways I hated it. First, why did they spend season after season making us root for Barney and Robin, and hope that Ted would just calm down, burn the blue horn and move on if they were only going to have them divorce?? They got divorced because Robin traveled too much for work . . . . . ??? Riiiiiiight. Next, and this is my biggest gripe of all, THEY KILLED OFF THE MOM!! Holy hell. That was so mean. We spent all season falling in love with her! We spent the last nine years knowing that she was super perfect for Ted! And we love Ted, we really wanted him to be happy, and we went into the show knowing that he would ultimately end up happy, WITH HER! Finally, the group growing apart at the end? I mean, I get it. Nathan and I are at that stage in life too, where kids and work suddenly take priority and you spend less time sitting around drinking beers with your friends than you would like (like none at all). But! And this is a huge BUT, that’s why we watched the damn show in the first place! So we could live vicariously through them!! Hello, that’s what TV is about. So to end my epic #firstworldproblems rant, I would just like to say to the writers in the words of the wise Lily Aldrin: You SONAFABEEETCH. One thing that never disappoints, leaves you wishing you hadn’t invested 9 years in fake characters, makes you shake your fist at the TV, or question your sanity at the level of anger that a TV show can evoke from you? Easy and cute desserts! 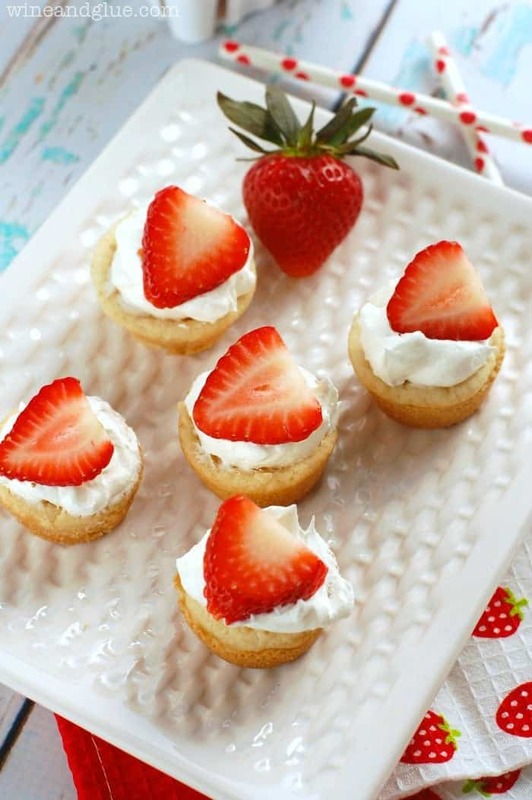 Like these Strawberry Shortcake Sugar Cookie Cups! Seriously. It doesn’t get cuter or easier than this. I love these as a dessert for the summertime, like after dinner on the deck or a BBQ with friends. You just make the cookie cups ahead of time, keep them in an airtight container, and then when you are ready to serve, top with a dollop of whipped topping and some sliced strawberries. Yum! Just before serving, top the cookie cup with a little bit of whipped topping and a slice or two of strawberry. Thanks Amy!! Lol, come back after you watch it! I saw HIMYM and I scrolled right past. We haven’t watched yet – I want to catch up tonight…or the next few nights. We have 6 episodes I think. 🙂 I love these cookie cups! They’re so perfect! Message me when you finish Dorothy! Yuck! Makes me glad we stopped watching it long ago…..I hate it when shows you love end badly! It’s so unsettling! Love Strawberry Shortcake! My favorite dessert – these sound so good! Re: HIMYM – I didn’t get to watch the episode but I read all the spoilers and now I am not sure I want to watch it!! I probably would’ve been pissed had I – probably would’ve yelled at the TV. I am sure if I decide to watch it – I will be yelling! LOL! I can officially say I’m glad I wasn’t an avid HIMYM watcher! I’ll just enjoy these little treats instead! 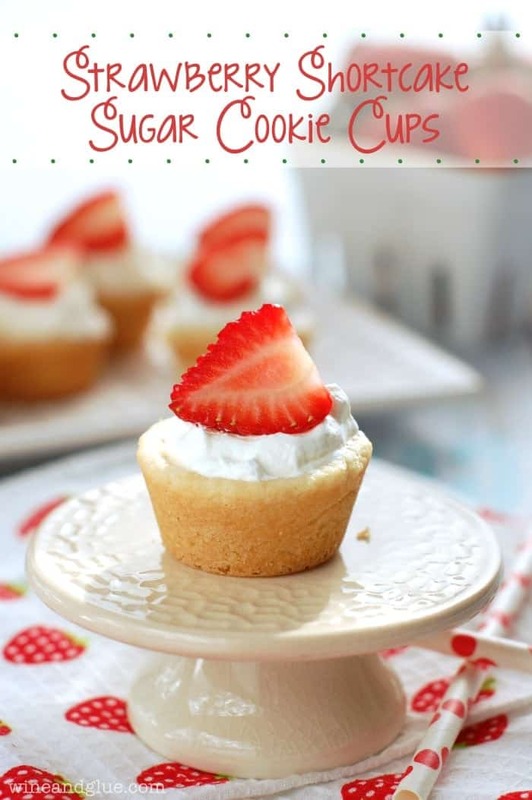 What font did you use on the top of the picture of the strawberry shortcake cookie cups? It has the dots above and below it…not the post title font. It’s really cute whatever it is. 🙂 And these are the perfect mini strawberry shortcakes, thanks for the great idea! These are so adorable! 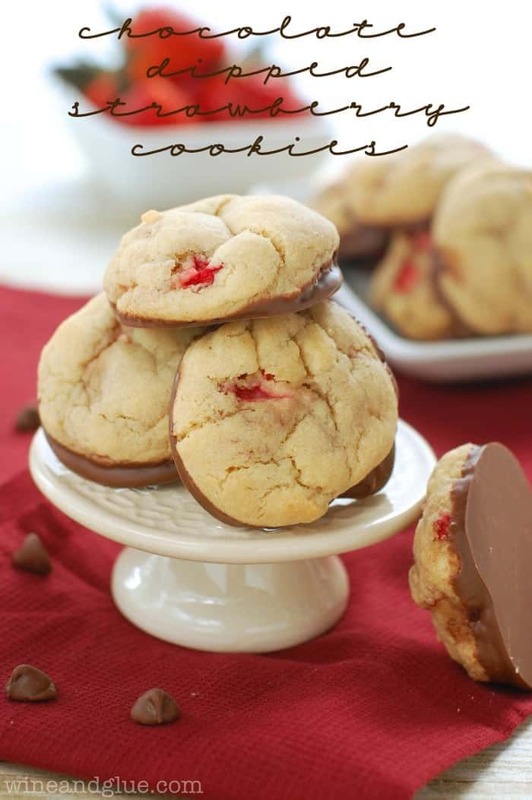 Strawberries have been really good lately and I’ll bet they are amazing on your cookies! Adorable! It’s Autumn here so I wont be eating a strawberry in a while. I’ll just have to live vicariously through northern hemisphere blogs. What a simple recipe to whip up when people are visiting or you need something in a jiffy. These are almost to cute to eat… But I would lol 🙂 I would love for you to share this on my Friday T.G.I.F. linky party 🙂 Have a great weekend!! Ugh! I absolutely despised the HIMYM finale too! They spent the entire season on Barney and Robin’s wedding weekend only to have them divorce in the first ten minutes of the finale?! Total waste of time! And having Ted end up going back to Robin completely negates the whole relationship with the mother! Bleck! Plus, we never found out the details about The Pineapple Incident! Too bad I didn’t have some of these cookie cups on Monday night – at least there would have been SOMETHING to enjoy! These look scrumptious, and so easy to make! Stopping by from Best of the Weekend! Okay, these cookie cups are totally genius! 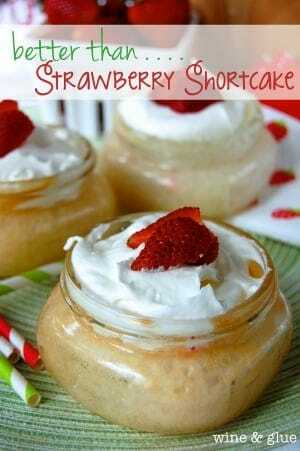 Perfect way to combine my love for strawberry shortcake and sugar cookies in one dessert! pinned. I’m a sucker for strawberry shortcake anything! I’m going to have to try this. Did you just place the ball of dough in the muffin tin, or did you shape it to the “cup” shape? I’m a baking enthusiast and still trying to learn the tricks of the trade. Thank you and I love your recipes! Nope, just dropped the ball of dough in the mini muffin pan. Good luck Amanda! Made these sugar cookies cups with great success using Pillsbury brand sugar cookie dough. Made again another time using the Aldi brand of sugar cookie dough, NOT successful. The Aldi brand does not sink down in the middle to allow for filling. Stick with Pillsbury.